PENANG MEDICAL COLLEGE SDN BHD . 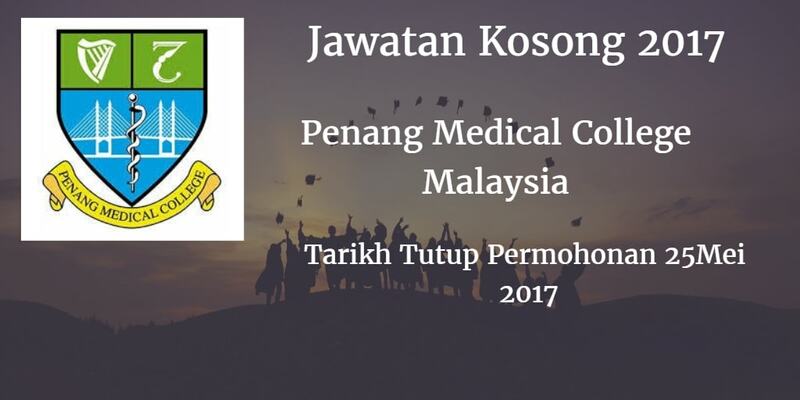 Sukacita dimaklumkan bahawa terdapat pelbagai kekosongan jawatan PENANG MEDICAL COLLEGE SDN BHD akademik dan bukan akademik berikut. Peluang kerjaya di PENANG MEDICAL COLLEGE SDN BHD . PENANG MEDICAL COLLEGE SDN BHD would like to invite qualified candidate to fill in below vacant position vacancy. PhD candidates, who have completed VIVA, are encouraged to apply. A minimum of 3 years working experience in related discipline. Proven track record in both undergraduate and postgraduate teaching in Public Health. Malaysian Medical Council (MMC) and/or the Irish Medical Council (IMC). Specialist qualification in related disciplines. Malaysian applicants must have valid MMC and APC registrations when applying for clinical teaching positions. Attractive international remuneration package are available for expatriates. Positions available are based in Penang, Malaysia. Closing date: : 25 th May 2017. Only short listed candidates will be notified. 4, Jalan Sepoy Lines, 10450 Penang, Malaysia.